The CYP2C genes are extensively regulated at the transcriptional stage. The present study shows for the first time that CYP2Cs are also regulated post-transcriptionally by microRNAs (miRNAs). By using online search engines, we found potential miRNA response elements (MREs) in the 3′-untranslated region (3′-UTR) of the CYP2C mRNAs. Among these were a MRE for the miRNAs miR-103 and miR-107 in the 3′-UTR of human CYP2C8. CYP2C8 protein levels (measured through immunoblot analyses) did not correlate with CYP2C8 mRNA levels (measured through quantitative polymerase chain reaction analyses) in human liver samples. The translation efficiency (protein/mRNA ratio) for CYP2C8 was inversely correlated with the expression of miR-103 and miR-107. When three copies of the putative MRE from CYP2C8 were inserted downstream from a luciferase expression reporter, transfection with precursors for miR-103 or miR-107 decreased luciferase activity in primary hepatocytes, whereas transfection with antisense oligonucleotides (AsOs) for miR-103/miR-107 increased luciferase activity. As expected, there was no effect of the precursors or AsOs when three copies of the putative MRE were inserted in the reverse orientation. When precursors for miR-103/miR-107 were transfected into primary human hepatocytes, CYP2C8 protein levels were decreased, whereas AsOs increased CYP2C8 protein levels. Neither precursors nor AsOs affected CYP2C8 mRNA levels, which indicated that the effect was post-transcriptional. Putative MRE motifs were also found in the 3′-UTRs of CYP2C9 and CYP2C19, which suggested that the same miRNAs could regulate translation of other members of the CYP2C family, although to a lesser degree than CYP2C8. These results clearly show that CYP2Cs are regulated post-transcriptionally by miR-103 and miR-107. Cytochrome P450 monooxygenases provide crucial protection from xenobiotics and environmental toxins by metabolizing those hydrophobic compounds and converting them to more-soluble, inactive compounds that are more readily excreted. In humans, the CYP2C subfamily of cytochrome P450 enzymes, consisting of CYP2C8, CYP2C9, CYP2C19, and CYP2C18, is an important subfamily of drug-metabolizing enzymes responsible for the metabolism of ∼20% of all clinically prescribed therapeutic agents (Goldstein, 2001). They are found at highest levels in human liver (Goldstein and de Morais, 1994; Inoue et al., 1994; Klose et al., 1999; Nishimura et al., 2003), but CYP2C protein and/or mRNA expression has been detected at lower levels in extrahepatic tissues such as kidney, lung, heart, endothelial tissue, adrenal gland, mammary gland, and brain (McFayden et al., 1998; Klose et al., 1999; Nishimura et al., 2003; Yasar et al., 2003; Delozier et al., 2007; Deng et al., 2011). Numerous studies have described the transcriptional up-regulation of CYP2C genes by xenobiotics (Pascussi et al., 2000a; Ferguson et al., 2002; Chen et al., 2004), including clinically prescribed and nonprescription drugs such as phenobarbital, rifampicin, St. John's wort, and dexamethasone, through the xenobiotic-sensing receptors constitutive androstane receptor (CAR), pregnane X receptor (PXR), and glucocorticoid receptor (GR) (Ferguson et al., 2002; Chen et al., 2003a, 2004; Rana et al., 2010, 2011; Surapureddi et al., 2011). The CYP2C genes are also up-regulated by the liver-enriched receptor hepatic nuclear factor 4α (HNF4α) (Ferguson et al., 2005; Rana et al., 2010; Yue et al., 2010). To date, however, no information concerning the possible translational regulation of these enzymes is available. MicroRNAs (miRNAs) have been discovered as a new class of small noncoding RNA genes (∼22-nucleotides) that play important roles in the regulation of target genes, frequently by promoting mRNA degradation and repressing mRNA translation by binding to the 3′-untranslated region (3′-UTR) or the coding region of target mRNAs (Bartel, 2004). Approximately 1000 miRNAs have been identified in humans, and miRNAs are predicted to control 40 to 90% of the genes within the human genome (Lewis et al., 2005; Xie et al., 2005). MicroRNAs have been found to be involved in biological processes such as development, cell cycling, apoptosis, proliferation, differentiation, and carcinogenesis (Ambros, 2003; Carrington and Ambros, 2003; Sempere et al., 2003; He and Hannon, 2004; Gandellini et al., 2011). MicroRNAs can affect the translation of multiple targets. MicroRNAs have also been reported to affect the expression of certain cytochrome P450 enzymes. Tsuchiya et al. (2006) reported that the miRNA miR-27b bound to a potential MRE in the 3′-UTR of CYP1B1 and affected the expression of CYP1B1 in MCF-7 cells (a human breast cell line). Moreover, they found an association between expression of CYP1B1 protein and miR-27b in breast cancer tissue. The group also found that CYP2E1 was regulated by miR-378; they established HEK293 cell lines stably expressing CYP2E1 mRNA with or without the 3′-UTR (Mohri et al., 2010). When those cells were treated with precursor for miR-378, CYP2E1 protein levels were decreased in the cell line that contained the 3′-UTR of CYP2E1 but not in the cell line that lacked the 3′-UTR. Although there was some effect of miR-378 on CYP2E1 mRNA, the effect was primarily translational. A MRE for miR-148 regulated the effects of the xenobiotic-sensing receptor PXR, and miR-148a decreased the induction of PXR targets, including CYP3A4 (Takagi et al., 2008). By performing an online search with the miRBase Targets database and TargetScan (Griffiths-Jones, 2004), we found several potential MREs for miRNAs in the 3′-UTR of the human CYP2C mRNAs, including miR-103 and miR-107 in the 3′-untranslated region of CYPC8. miR-103 and miR-107 belong to the miR-15/107 group of miRNAs, which contain the seed sequence AGCAGCA at or near the 5′-region of the mature miRNA. They are widely expressed in numerous human tissues, including liver, brain, heart, and lung (Finnerty et al., 2010). They are transcribed from the introns of PANK genes, which are involved in the regulation of acetyl-CoA levels, cell stress, insulin sensitivity, lipid metabolism, ischemic stress, and hypoxia, as well as angiogenesis and vascular endothelial growth factor regulation (Trajkovski et al., 2011). miR-103 and miR-107 may also be involved in the regulation of some of these pathways. In the present study, we show that miR-103 and miR-107 affect the post-translational regulation of the human hepatic CYP2C family, particularly CYP2C8. Human Livers, Cell Culture Conditions, and Reagents. Human primary hepatocytes and 31 liver samples representing excess tissue from hepatocyte preparations from individual donors were obtained from CellzDirect/Invitrogen (Durham, NC). Use of these hepatocytes was ruled exempt by the National Institutes of Health, Office of Human Subjects Research (Bethesda, MD) because they were from commercially available, anonymous sources. HepG2 cells were grown under standard growth conditions. The pMIR-REPORT miRNA expression reporter vector system was obtained from Ambion (Austin, TX). Lipofectamine 2000 was obtained from Invitrogen (Carlsbad, CA). Precursors for miR-103 and miR-107 and negative control preparations were obtained from Ambion. Locked nucleic acid-modified antisense oligonucleotides (AsOs) for miR-103 (5′-CATAGCCCTGTACAATGCTGC-3′) and miR-107 (5′-GATAGCCCTGTACAATG-3′) and negative control samples (5′-GTGTAACACGTCTATACGCCA-3′) were obtained from Exiqon (Woburn, MA). All primers and oligonucleotides were commercially synthesized at Integrated DNA Technologies (Coralville, IA). 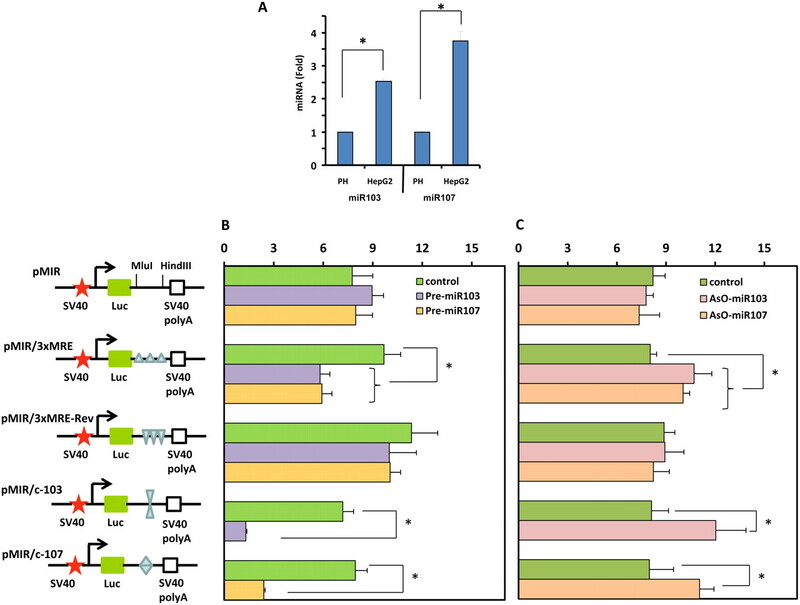 To construct luciferase reporter plasmids, target oligonucleotides were inserted between the MluI and HindIII sites downstream from the luciferase gene in the pMIR-REPORT miRNA expression reporter vector. The sequence from position 1670 to position 1692 (∼200 bp downstream from the stop codon) in the human CYP2C8 mRNA (5′-AACACTTGTATTAATTGCTGCATATGCT-3′), containing a putative miR-103/miR-107 recognition element, was termed CYP2C8MRE. Three copies of the CYP2C8MRE (5′- AACACTTGTATTAATTGCTGCATATGCTNNNNNNNAACACTTGTATTAATTGCTGCATATGCTNNNNNNNAACACTTGTATTAATTGCTGCATATGCT-3′; the MRE is underlined) were cloned into the pMIR-REPORT expression reporter vector (termed pMIR/3XMRE). The complementary sequence of the three copies of CYP2C8MRE was cloned into the pMIR-REPORT expression reporter vector as a negative control (termed pMIR/3XMRE-Rev). Oligonucleotides containing the perfect matching sequences of mature miR-103 (5′-TCATAGCCCTGTACAATGCTGCT-3′) and miR-107 (5′-TGATAGCCCTGTACAATGCTGCT-3′), both containing the 5′ seed sequence AGCAGC (underlined), were cloned into the pMIR-REPORT expression reporter vector as positive controls. All constructs were verified through sequencing. Total RNA was isolated by using a mirVana miRNA isolation kit (Applied Biosystems, Foster City, CA). For quantification of mature miRNA, cDNA was reverse-transcribed from total RNA by using specific primers from the TaqMan microRNA assay (Applied Biosystems) and reagents from the TaqMan microRNA reverse transcription kit (Applied Biosystems). Amplification reactions were performed by using the TaqMan microRNA assay and TaqMan Universal PCR Master Mix (Applied Biosystems). RNU44 was used as the endogenous control. To determine CYP2C8 mRNA expression levels, cDNA was synthesized from total RNA with MultiScribe reverse transcriptase (Applied Biosystems) and was quantified by using the TaqMan gene expression assay (Applied Biosystems) with TaqMan Universal PCR Master Mix. GAPDH was used as the endogenous control. Real-time PCR assays were performed with an Applied Biosystems 7900HT sequence detection system. Relative quantities were normalized to endogenous control values and were calculated by using the 2−ΔΔCt method. A series of luciferase reporter plasmids or empty vector controls were transiently transfected, with the internal control pRL-TK plasmid, into human primary hepatocytes and HepG2 cells by using Lipofectamine 2000 (Invitrogen). miR-103 or miR-107 precursors (10 pmol; Applied Biosystems), precursor controls, miRCURY AsOs for miR-103 or miR-107 (10 or 50 pmol; Exiqon), or AsO controls were transiently transfected into cells. After 48 h, the cells were resuspended in passive lysis buffer (Promega, Madison, WI). Luciferase assays were performed by using a dual luciferase assay kit (Promega), and firefly luciferase activities were normalized with respect to Renilla reniformis luciferase activities. The CYP2C8-specific peptide DNQKSEFNIENLVGC was synthesized by ResGen (a division of Invitrogen) and was coupled to keyhole limpet hemocyanin through the C-terminal cysteine. A new polyclonal antibody specific for the CYP2C8 peptide (termed antibody 1937) was produced by Covance Research Products (Denver, PA) with the standard National Institute of Environmental Health Sciences protocol, as follows. At the start of production, a 1 mg/ml suspension of conjugated peptide was diluted 1:1 with Freund's complete adjuvant, and two rabbits each received 500 μg (1 ml) after prebleeding. After 4 weeks, each rabbit received a boost of 250 μg of peptide diluted (1:1) with Freund's incomplete adjuvant, followed by a test bleeding after 2 weeks. Rabbits received four additional boosts at 4-week intervals, with production bleedings beginning after the third boost. Rabbits were killed through exsanguination at the completion of production. Antibodies used in this study were from the second production bleeding. This antibody was specific for CYP2C8 on immunoblots. Antibody to CYP2C19 (termed antibody 1590) was similarly raised in rabbits by using bacterially expressed recombinant CYP2C19. This antibody recognizes all of the human CYP2C enzymes (CYP2C9 > CYP2C19 ≫ CYP2C8), but the enzymes can be distinguished on the basis of their electrophoretic mobility on 16-cm gels. Mouse monoclonal antibodies to HNF4α (clone H1415) and CAR (clone N4111) were obtained from R&D Systems (Minneapolis, MN). Anti-GAPDH, anti-GR, anti-HNF4α, and anti-CAR antibodies were obtained from Santa Cruz Biotechnology (Santa Cruz, CA). Ten or 50 pmol of precursors or AsOs for miRNAs or their respective controls were transiently transfected into human primary hepatocytes by using Lipofectamine 2000. After 72 h, the cells were harvested. Cell homogenates from human primary cells or human livers were prepared through homogenization in lysis buffer. Samples were separated through 10% Tris/glycine/SDS gel electrophoresis (using 16-cm gels for the anti-CYP2C19 antibody) and were transferred to a nitrocellulose membrane (Invitrogen). The membrane was blocked with 5% nonfat milk in blocking buffer and was blotted with rabbit anti-human CYP2C8 (peptide) or anti-GAPDH (Cell Signaling Technology, Danvers, MA) primary antibody. Goat anti-rabbit horseradish peroxidase (Thermo Fisher Scientific, Waltham, MA) was used as a secondary antibody. The protein bands on the membranes were developed by using a SuperSignal West Femto kit (Thermo Fisher Scientific). The blots were imaged with a GeneGnome imaging system (Syngene, Frederick, MD), and bands were quantitated by using GeneTools (which was provided with the imaging system). 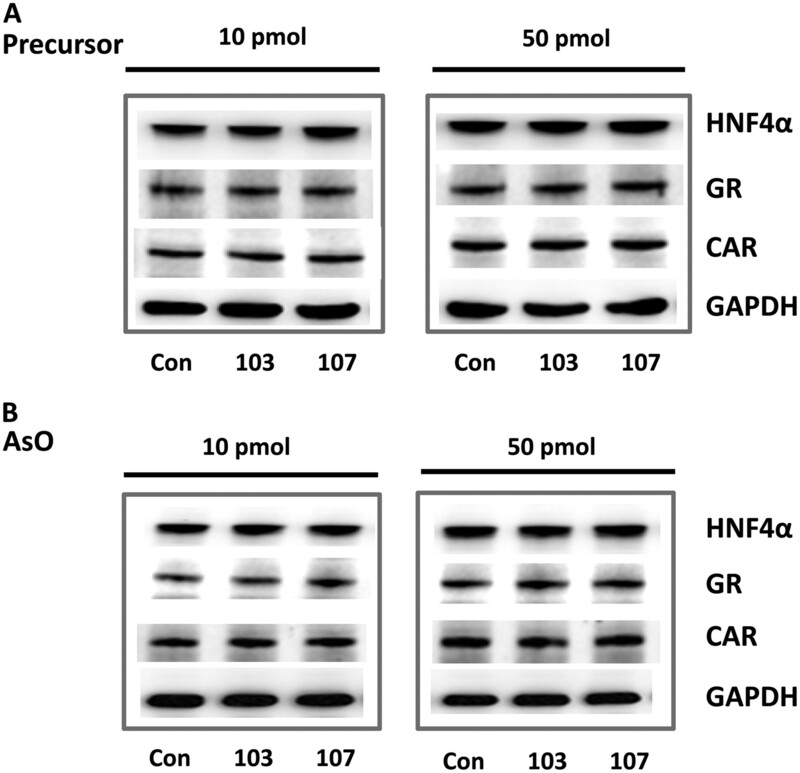 For immunoblotting of HNF4α, GR, or CAR, cell homogenates from three replicate wells were combined and immunoblotted with antibodies to HNF4α, GR, CAR, or GAPDH (as a loading control). Data are expressed as the mean ± S.E. of triplicate determinations or of three independent experiments. Correlation analysis was performed with Spearman's rank method. The statistical significance of the difference between the expression levels of miR-103 and miR-107 in human liver samples was determined with a paired, two-tailed, Student's t test. The relationship between CYP2C8 protein levels and miR-103/miR-107 levels was investigated with analysis of variance and Tukey's test. Values of P < 0.05 were considered statistically significant. Relationships between Human CYP2C8 Protein, mRNA, and miRNA Expression Levels in 31 Human Liver Tissues. Through Western blot analyses and quantitative PCR assays, we measured human CYP2C8 protein and mRNA expression levels in a panel of 31 human liver tissues representing excess tissue from hepatocyte preparations obtained from CellzDirect. As shown in Fig. 1A, there was no statistically significant correlation between CYP2C8 mRNA and protein levels (Spearman ρ = 0.09, P > 0.05), which suggested the possibility that CYP2C8 might be post-transcriptionally regulated. Therefore, we used the online search engines miRBase (http://www.mirbase.org) and TargetScan Release 6 (http://www.targetscan.org), which identified several potential recognition elements for microRNAs in the 3′-UTR for the human CYP2C genes. Among these, a potential miR-103/miR-107 target site was found ∼200 bp (197–219 bp) downstream from the stop codon of human CYP2C8 mRNA, with minimal free energy of −10.20 and a miRBase score of 141.00; TargetScan scores were −0.24, with a seed match of 7mer1A, for both miRNAs. The alignment of miR-103/miR-107 and that of the putative recognition element in CYP2C8 mRNA are shown in Fig. 1B. These two miRNAs differ by only one nucleotide, at the second position from the 3′ end, where the G nucleotide in miR-103 is different from the C nucleotide in miR-107. We termed the putative recognition element 2C8MRE103/2C8MRE107. To investigate the possible role of miR-103/miR-107 in the translational regulation of CYP2C8 in human liver tissue, we first compared the expression levels of miR-103 and miR-107 with those of CYP2C8 protein by using the same panel of 31 human livers. The miR-103/miR-107 expression levels were variable in human livers. CYP2C8 protein/mRNA ratios were calculated as an index of CYP2C8 translation efficiency and were compared with levels of miR-103 and miR-107. The CYP2C8 translation efficiency was inversely correlated with levels of miR-103 (Spearman ρ = −0.4, P < 0.05) and miR-107 (Spearman ρ = −0.5, P < 0.05) (Fig. 2) in human livers, consistent with the possibility that CYP2C8 may be negatively regulated by miR-103 and miR-107. 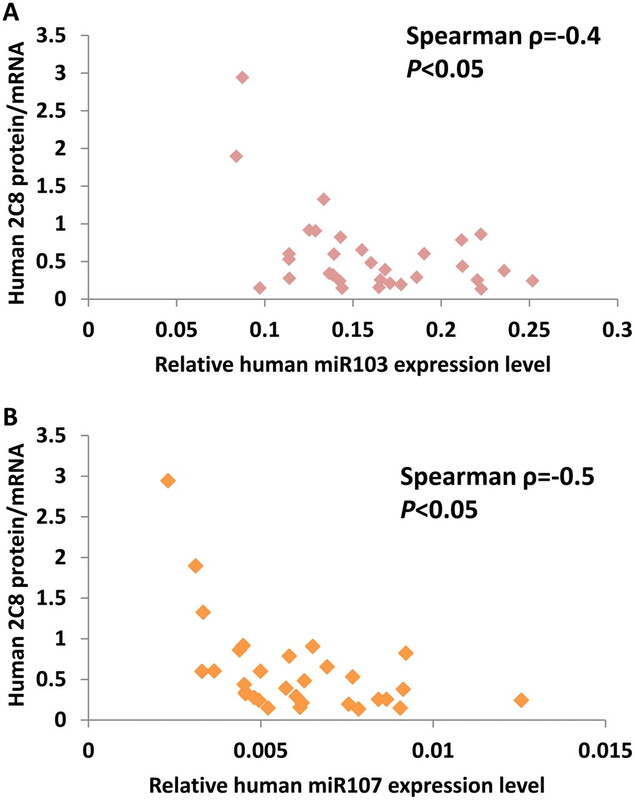 Correlation between CYP2C8 mRNA and protein levels in 31 human liver samples (A) and predicted target sequence for miR-103/miR-107 in human CYP2C8 mRNA (B). A, CYP2C8 mRNA levels were determined with real-time quantitative PCR assays and were normalized with respect to GAPDH mRNA levels. Microsomal CYP2C8 protein contents were determined through immunoblotting with an antibody specific for CYP2C8 and were normalized with respect to GAPDH protein levels. As determined through Spearman correlation analysis, there was no significant correlation between CYP2C8 mRNA levels and protein levels. B, the predicted target sequence for miR-103/miR-107 in human CYP2C8 mRNA was identified. The numbering refers to the ATG in translation starting with A as 1; the coding region continues to position 1470, with a stop codon at positions 1471 to 1473. The sequence of the putative 2C8MRE (gray box) is located 197 to 219 bp downstream from the stop codon in the 3′-UTR of human CYP2C8 mRNA. Inverse relationships between miR103 (A) and miR-107 (B) expression levels and human CYP2C8 protein translation efficiency (protein/mRNA ratio) in human liver samples. Spearman analysis showed inverse correlations (miR-103, ρ = −0.4; miR-107, ρ = −0.5; P < 0.05). Expression Levels of Mature miR-103 and miR-107 in Human Primary Hepatocytes and HepG2 Cells. CYP2C8 mRNA is expressed at considerably higher levels in human liver than in HepG2 cells, and we have been unable to detect CYP2C8 protein in this hepatic cancer cell line. To quantify the levels of miRNA in primary hepatocytes (representing human liver samples) and HepG2 cells (representing tumor cell lines), total RNA was isolated by using a mirVana miRNA isolation kit (Ambion). Quantification of miRNA was performed as described in Materials and Methods. RNU44 was used as an endogenous control, as shown in Fig. 3A. Human mature miR-103/miR-107 expression levels were determined in both primary hepatocytes and HepG2 cells as 2−ΔΔCt values normalized to human RNU44 levels. Expression levels of mature miR-103 and miR-107 were found to be higher (2.5- and 4-fold higher, respectively) in HepG2 cells than in primary human hepatocytes. In HepG2 cells, the relative miR-107 expression level seemed to be moderately higher than the miR-103 expression level (Fig. 3A). Human CYP2C8 regulation by miR-103/miR-107. A, relative endogenous expression levels of miR-103 and miR-107 in primary hepatocytes (PH) and HepG2 cells were determined through real-time quantitative PCR analysis using a TaqMan miRNA assay kit, and the levels of mature miR-103 and miR-107 were normalized with respect to RNU44 levels with the 2−ΔΔCt method. B and C, luciferase assays were performed to investigate whether miR-103 and miR-107 functionally regulated CYP2C8MRE. The reporter constructs were transiently transfected into primary human hepatocytes with 10 pmol of the precursors for miR-103 or miR-107 or control precursors (B) or with 10 pmol of AsOs for miR-103 or miR-107 or AsO controls (C). pMIR-driven firefly luciferase activities were normalized with respect to R. reniformis luciferase activities and were plotted relative to values obtained with the pMIR control vector. Each column represents the mean ± S.E. of three independent experiments. *, significantly different from precursor or AsO control, P < 0.05. Regulation of CYP2C8 by MRE in 3′-UTR of CYP2C8 in Primary Human Hepatocytes. To determine whether the putative CYP2C8MRE was functionally recognized by miR-103/miR-107, luciferase assays were performed in human primary hepatocytes (Fig. 3B). pMIR/P-Seq-miR-103 and pMIR/P-Seq-miR-107 constructs in which the miR-103 and miR-107 complementary sequences were individually inserted downstream from the luciferase gene, driven by the SV40 promoter, were used as positive controls. Luciferase activation of both constructs was significantly decreased (P < 0.05) by cotransfection with the respective individual precursors (miR-103 and miR-107) (Fig. 3B). The luciferase activity of pMIR/3XMRE constructs, which contained three copies of the putative miR-103/miR-107 CYP2C8 recognition site downstream from the luciferase gene, was significantly decreased (by ∼40%; P < 0.05) when pMIR/3XMRE103 was cotransfected with 10 pmol of the precursors for miR-103 or miR-107 (individually). The negative control pMIR/3XMRE-Rev construct, which contained three copies of the inverted putative recognition site, had no effect when precursors for miR-103 or miR-107 were cotransfected individually. Human primary hepatocytes express significant levels of miR-103 and miR-107, and the luciferase activities of pMIR/P-Seq-miR-103 and pMIR/P-Seq-miR-107 were significantly increased when miR-103 or miR-107 expression was silenced through transfection of 10 pmol of specific AsOs for either miRNA (Fig. 3C). The luciferase activity of the pMIR/3XMRE construct was significantly increased (P < 0.05) when the construct was cotransfected with 10 pmol of AsOs for miR-103 or miR-107. As expected, silencing of miR-103 and miR-107 with AsOs had no effect on the luciferase activity of the negative control pMIR/3XMRE-Rev construct. Taken together, these results indicate that miR-103 and miR-107 functionally recognize 2C8MRE103/2C8MRE107 to regulate negatively the expression of CYP2C8. We examined the effects of miR-103/miR-107 precursors on pMIR-Luc constructs in HepG2 cells (Fig. 4A). As shown in Fig. 3A, HepG2 cells express miR-103/miR-107 at higher levels than do primary hepatocytes. Ten picomoles of the miR-103/miR-107 precursors were effective in decreasing the luciferase activities of both the positive control pMIR-Luc constructs and the pMIR/3XMRE construct. In contrast, 10 pmol of AsOs for miR-103 and miR-107 did not have any significant effect on the positive pMIR/c-103 and pMIR/c-107 constructs in preliminary experiments, presumably because of the abundance of precursors for miR-103 and miR-107 in HepG2 cells. When miR-103 and miR-107 were silenced with 50 pmol of either AsO, however, we observed marked increases in luciferase activity with the positive control luciferase constructs and the construct containing three copies of the CYP2C8 MRE (Fig. 4B). A higher dose of 100 pmol had deleterious effects on cell viability (see below). Taken together, these results indicate that both miR-103 and miR-107 functionally recognize 2C8MRE to regulate negatively the expression of CYP2C8 in both HepG2 cells and primary human hepatocytes. Regulation of CYP2C8 MRE by miR-103/miR-107 in HepG2 cells. A, HepG2 cells were transfected with pMIR, pMIR/3XMRE, pMIR/3XMRE-Rev, or the complementary sequences pMIR/c-103 or pMIR/c-107 and with 10 pmol of control, miR-103, or miR-107 precursors. B, pMIR constructs were transfected with AsO inhibitors for miR-103 and miR-107 at 50 pmol. Each column represents the mean ± S.E. of three independent experiments. *, significantly different from control, P < 0.05. Determination of Optimal Concentrations of miR-103/miR-107 Precursors and AsO Silencers for Function and Cell Viability. To ascertain whether we were using the optimal concentrations of precursors and AsOs for miR-103 and miR-107 in HepG2 cells and to determine whether the levels of precursors and AsOs we were using were toxic to primary hepatocytes and HepG2 cells, we performed the following experiments. HepG2 cells and primary human hepatocytes were transfected with different doses of miR-103 precursors and were compared with Lipofectamine 2000-treated control cells and untransfected cells. There was a 5% decrease in viability in Lipofectamine 2000-treated cells, compared with untreated cells, but there was no effect of the miR-103 precursor on the viability of HepG2 cells at any of the doses tested (10, 50, and 100 pmol) and only a minimal (≤5%) decrease in the viability of primary human hepatocytes treated with the miR-103 precursor, compared with the precursor control (Fig. 5, A and B). When miR-103 was inhibited with locked nucleic acids (AsOs) in HepG2 cells, we saw no effect on viability at doses below 100 pmol (which significantly decreased viability) for both the miR-103 AsO and its control. In primary hepatocytes, 10- and 50-pmol doses of the AsO control and the AsO for miR-103 were tolerated relatively well (∼10–15% decreases in viability), but 100-pmol doses were more toxic (24% decrease in viability) (Fig. 5, A and B). Effects of ectopic expression of miR-103 at higher concentrations on cell viability and functionality. A and B, human primary hepatocytes (A) or HepG2 cells (B) were transfected with precursors or AsO inhibitors for miR-103 with Lipofectamine 2000, and their viability was compared with that of untransfected cells or cells treated with the transfection agent alone. There was a ∼5% decrease in viability when cells were treated with Lipofectamine 2000. However, precursors at 10, 50, or 100 pmol did not affect viability, compared with the precursor controls. AsOs did not affect viability in HepG2 cells at concentrations of 10 and 50 pmol, but both the AsO control and the AsO for miR-103 decreased viability by ∼10 to 15% at 100 pmol. In primary hepatocytes, AsOs and their controls affected viability by ∼10% at all doses but more (∼15%) at the highest dose of 100 pmol. C and D, to judge the effectiveness of the doses of precursors (C) and AsOs (D) for miR-103 on the activity of the luciferase constructs, the pMIR/c-103 positive control was used as a representative and was transfected into HepG2 cells in the presence of miR-103 precursors at 10, 50, or 100 pmol; results were compared with those for cells transfected with pMIR/c-103 alone. Ectopic expression of precursors for miR-103 inhibited luciferase activity at 10 pmol, but higher doses (50 and 100 pmol) of the precursor did not have additional effects. The specific AsO for miR-103 increased pMIR/c-103-driven luciferase activity at 50 pmol but was not effective at 10 pmol, compared with controls. AsO at 100 pmol did not show any significant increase over the level seen with 50 pmol. Values are the mean ± S.E. of triplicate observations. Con, control; P, precursor; A, AsO; 2000, Lipofectamine 2000. *, significantly different from precursor or AsO control, P < 0.05. We then tested the effectiveness and toxicity of varying doses of the precursor and AsO for miR-103 by using the positive control luciferase construct pMIR/c-103 in HepG2 cells (Fig. 5, C and D). As shown in Fig. 5C, 10 pmol of precursor produced a maximal effect with minimal toxicity. There was little effect of the precursor control at 10 pmol, compared with HepG2 cells transfected with Lipofectamine 2000 and the pMIR/c-103 construct alone (sham transfection). The AsO for miR-103 was not effective at 10 pmol in HepG2 cells, presumably because of the high concentrations of miR-103/miR-107 in HepG2 cells. Maximal increases in luciferase activity were seen with 50 pmol of AsO. Additional increases in AsO concentrations to 100 pmol did not have any added benefit, most likely because of the effects on cell viability. Effects of miR-103 and miR-107 on Human CYP2C8 Protein Expression in Human Primary Hepatocytes. We examined the effects of ectopic overexpression or silencing of miR-103 and miR-107 on CYP2C8 protein expression in primary hepatocytes. Transfection of the precursors for miR-103 or miR-107 into primary hepatocytes, which express small amounts of both, increased miR-103 and miR-107 miRNA levels several hundredfold (Fig. 6A). Ectopic expression of miR-103 and miR-107 at 10- and 50-pmol levels significantly decreased CYP2C8 protein levels, as measured through immunoblot analysis with a specific peptide antibody to CYP2C8, compared with the GAPDH control (Fig. 6B). The decrease appeared greater at 50 pmol than at 10 pmol. Conversely, transfection with 10 pmol of specific AsOs for miR-103 and miR-107 individually decreased the detectable levels of the two miRNAs by 70 to 80% (Fig. 6C) and increased endogenous CYP2C8 protein levels by 30 to 60%, compared with GAPDH, in primary human hepatocytes, with somewhat greater increases (50–80%) at the 50-pmol level (Fig. 6D). These results confirmed that miR-103 and miR-107 regulated human CYP2C8 protein contents in primary human hepatocytes. Regulation of human CYP2C8 protein levels through ectopic overexpression or silencing of miR-103 and miR-107 in primary human hepatocytes. A and C, cells were transfected with 10 or 50 pmol of precursors for miR-103 and miR-107 individually (A) or 10 or 50 pmol of AsOs (C) or the respective control (Con). After 72 h, total RNA and microsomal membranes were prepared as described. Mature miRNA levels were determined through real-time reverse transcription-PCR analysis after transfection with precursors or AsOs. Values were normalized with respect to RNU44 levels and expressed relative to control values. Microsomal human CYP2C8 and GAPDH levels were determined through immunoblot analysis. B and D, primary hepatocytes from one donor were transfected with 10 or 50 pmol of precursors (B) or 10 or 50 pmol of AsOs (D). Lanes represent results for one of three replicate wells. The relative CYP2C8 protein levels were analyzed through densitometric image analysis and expressed relative to GAPDH levels. Values are the mean ± S.E. of triplicate observations. *, significantly different from control, P < 0.05. Effects of miR-103 and miR-107 on Expression of Other CYP2C Enzymes. The CYP2C genes are closely related, with high degrees of amino acid and nucleic acid homology (Lewis et al., 2003). They are often transcriptionally regulated by many of the same receptors (Ferguson et al., 2002, 2005; Chen et al., 2003b; Chen and Goldstein, 2009). A scan of the 3′-UTRs of CYP2C8, CYP2C9, and CYP2C19 showed that all three contained putative elements similar to the MRE for miR-103/miR-107. In CYP2C9 cDNA, the putative MRE site is CATACTTATCTAATGTAGAG, with the core AATGCTG of miR-103 (miRBase) with a mismatch of two nucleotides, 240 to 260 bp downstream from the stop codon in the 3′-UTR. In CYP2C19, there are two possible MRE sites, the first 222 to 242 bp and the second 138 to 152 bp downstream from the stop codon. The MRE TGATACTTGTCTAATGTTGAG contains the core AATGCTG of miR-103 with a mismatch of only one nucleotide (miRBase). With putative MREs located in the UTRs of CYP2C9 and CYP2C19, we examined the effects of 50 pmol of precursors for miR-103 and miR-107 (Fig. 7A) or 50 pmol of AsOs for miR-103 and miR-107 (Fig. 7B) on CYP2C9 and CYP2C19 protein expression in primary human hepatocytes from a second donor. The crude membranes from hepatocyte lysates were separated on large 10% SDS-polyacrylamide gels and were immunoblotted with polyclonal antibody 1590, which recognizes all of the human CYP2C proteins (CYP2C9 > CYP2C19 ≫ CYP2C8). The individual CYP2C proteins were distinguished on the basis of differences in their electrophoretic mobilities on large SDS-polyacrylamide gels, in comparisons with recombinant proteins expressed in yeast. Antibody 1937 is a CYP2C8-specific antibody that recognizes only CYP2C8. The precursors for miR-103 and miR-107 down-regulated CYP2C8 to almost negligible levels (<10%) (Fig. 7A), compared with precursor controls, as determined through densitometric quantification (Fig. 7C). 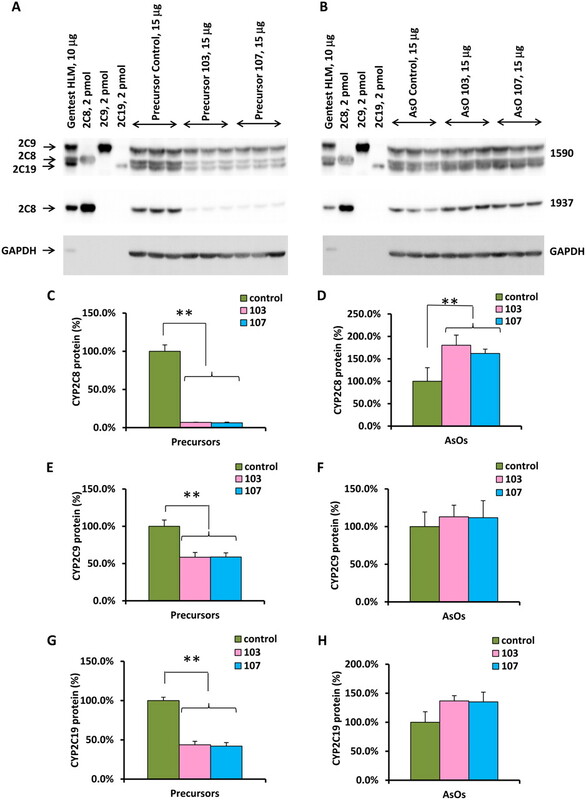 Knockdown of miR-103 and miR-107 through transfection with AsOs up-regulated CYP2C8 protein levels by more than 60 to 80% (Fig. 7, B and D). Quantification of CYP2C9 expression through immunoblotting with antibody 1590 showed only a ∼40% decrease in CYP2C9 protein levels after transfection with the precursors for miR-103 and miR-107 (Fig. 7, A and E), and knockdown of miR-103/miR-107 expression with specific AsOs had no significant effect (P ≤ 0.5) on CYP2C9 protein expression levels (Fig. 7, B and F). These data suggest that miR-103 and miR-107 have minimal roles in regulating CYP2C9 in human hepatocytes. When the polyclonal antibody 1590 was used to quantify CYP2C19 protein levels, miR-103 and miR-107 precursors down-regulated CYP2C19 levels by ∼60%, as determined through densitometric quantification (Fig. 7, A and G). The AsOs for miR-103 and miR-107 increased CYP2C19 protein levels by ∼30%, but this increase was not statistically significant (Fig. 7, B and H). These results suggest that miR-103 and miR-107 may regulate CYP2C19 more than CYP2C9 in human hepatocytes (but to a much lesser degree than CYP2C8). Results with a BD Gentest (Woburn, MA) antibody to a CYP2C19 peptide were not specific for CYP2C19 and yielded results similar to those obtained with antibody 1590 (data not shown). Effects of miR-103/miR-107 precursors or AsOs on expression of other CYP2C proteins. 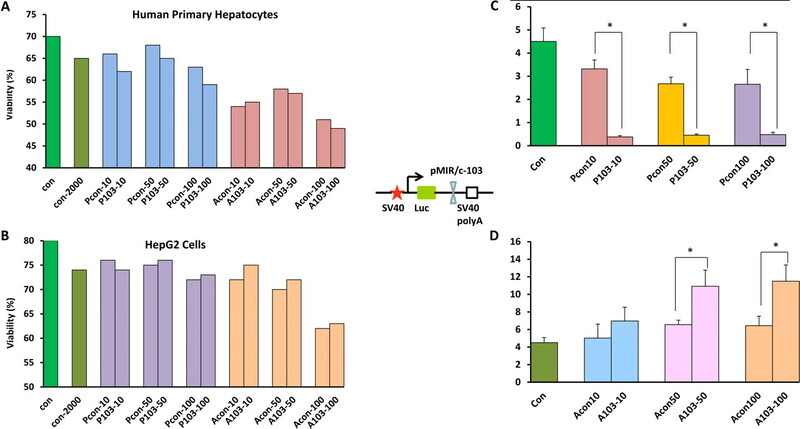 A and B, for each treatment, three separate wells of primary hepatocytes from a single donor were transfected with 50 pmol of control, miR-103, or miR-107 precursor miRNAs (A) or 50 pmol of control, miR-103, or miR-107 AsOs (B) for 48 h, and microsomal membranes were prepared from each set of donor hepatocytes. The membrane proteins were separated on large 10% SDS-polyacrylamide gels, with BD Gentest human liver microsomes (HLM) and recombinant CYP2Cs expressed in yeast as controls, and were transferred to nitrocellulose membranes. The membranes were probed with in-house-generated antibodies to CYP2C19 (antibody 1590), a specific CYP2C8 peptide (antibody 1937), and GAPDH. The antibody to CYP2C19 also recognized CYP2C9 and weakly recognized CYP2C8; therefore, the individual proteins could be identified only on the basis of their electrophoretic mobilities on large gels. C–H, the images were scanned and quantitated through densitometric analysis; data represent the means from three wells. 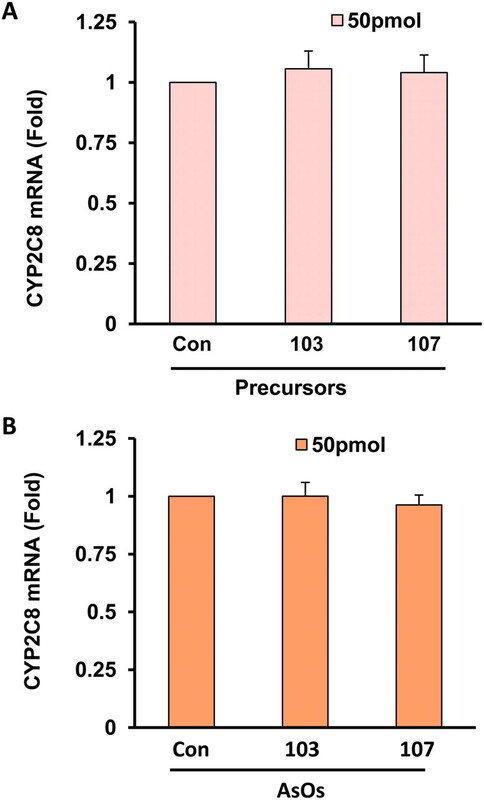 C, effects of precursor miRNAs on CYP2C8 protein levels. D, effects of AsOs on CYP2C8 protein levels. E, effects of precursor miRNAs on CYP2C9 levels. F, effects of AsOs on CYP2C9 levels. G, effects of precursor miRNAs on CYP2C19 levels. H, effects of AsOs on CYP2C19 levels. **, significantly different from precursor or AsO control, P < 0.01. Immnunoblotting of Hepatocyte Extracts for HNF4α, CAR, and GR. Because the CYP2Cs are regulated by CAR, GR, and HNF4α, we examined the cellular contents of these receptors 72 h after transfection of primary human hepatocytes with precursors for miR-103 or miR-107 or with AsOs to miR-103/miR-107, to decrease expression of these miRNAs (Fig. 8). These hepatocytes were from the study of the effects of miR-103/miR-107 on CYP2C protein expression (Fig. 6). There was no effect of miR-103 or miR-107 expression on CAR, GR, and HNF4α contents in primary hepatocytes, which suggests that the effect on CYP2C expression was a direct effect on the translational regulation of CYP2C proteins, rather than an indirect effect through changes in levels of receptors known to regulate CYP2C genes. Lack of effects of miR-103/miR-107 on expression of HNF4α, CAR, and GR in primary human hepatocytes. Hepatocytes were treated with 10 or 50 pmol of precursors for miR-103 or miR-107 (A) or 10 or 50 pmol of AsOs to miR-103/miR-107 (B) or the respective control (Con). These are the same cells as described for Fig. 6. Total cell lysates from three replicate wells were pooled and immunoblotted with antibodies to HNF4α, GR, CAR, and GAPDH (as control). Lack of Effects of miR-103 and miR-107 on CYP2C8 mRNA Levels. MicroRNAs most frequently affect translational regulation of genes, although some miRNAs also affect mRNA levels. Total RNA was isolated from primary hepatocytes that had been transfected with precursors for miR-103 and miR-107 (Fig. 9A) or with AsOs for miR-103 and miR-107 (Fig. 9B), or the respective controls. Precursors for miR-103 and miR-107 did not have any effect on CYP2C8 mRNA levels, as determined through quantitative PCR assays. AsOs for miR-103 and miR-107 did not increase CYP2C8 mRNA levels, which suggests that the site of action of these miRNAs on CYP2C8 regulation is at the level of translation and not transcription. Lack of effects of ectopic overexpression or silencing of miR-103/miR-107 with AsOs on human CYP2C8 mRNA levels in human primary hepatocytes. Fifty picomoles of precursors (A) or AsO inhibitors (B) or control (Con) were transfected into cells. After 72 h, the cells were harvested, total RNA was isolated, and CYP2C8 mRNA levels were determined through real-time reverse transcription-PCR analyses. Data represent mean ± S.E. (n = 3). CYP2C8 detoxifies a variety of important xenobiotic compounds, primarily in liver but also in extrahepatic tissues (Goldstein, 2001; Totah and Rettie, 2005). CYP2C8 metabolizes the endogenous substrate arachidonic acid to produce various epoxyeicosatrienoic acids in liver and extrahepatic tissues (e.g., heart and endothelial cells) and is important for the regulation of vascular tone and cardiovascular homeostasis (Dai et al., 2001; Edin et al., 2011). 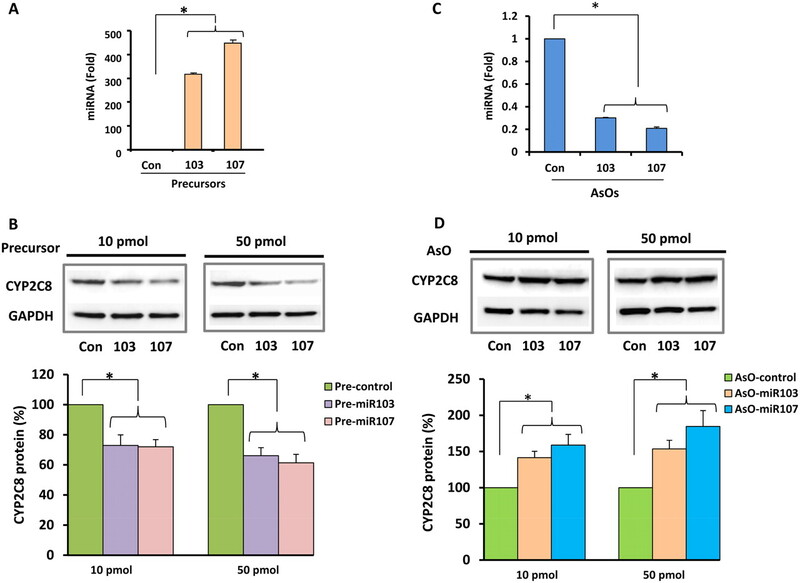 CYP2C8 plays a central role in the metabolism of a number of therapeutic drugs, including the anticancer drug paclitaxel (Taxol) (Rahman et al., 1994; Cresteil et al., 2002), the cholesterol-lowering drug cerivastatin (Wang et al., 2002; Ogilvie et al., 2006), the antimalarial drug amodiaquine (Li et al., 2002), the antidiabetic drugs troglitazone (Yamazaki et al., 1999) and rosiglitazone (Baldwin et al., 1999), the antiarrhythmic drug amiodarone (Ohyama et al., 2000), and the calcium channel blocker verapamil (Tracy et al., 1999). Previous studies showed that the CYP2C genes are transcriptionally up-regulated by rifampicin (Ferguson et al., 2005), phenobarbital (Pascussi et al., 2000b; Raucy et al., 2002), and dexamethasone (Gerbal-Chaloin et al., 2001) through a number of xenobiotic-sensing nuclear receptors, including PXR, CAR, and GR (Ferguson et al., 2005), and by HNF4α (Rana et al., 2010). This is the first study to show that CYP2C8 is regulated post-transcriptionally by miRNAs. We showed that there was no significant correlation between the mRNA levels and the protein levels in human liver samples, which is consistent with possible translational regulation of CYP2C8. In a panel of 31 liver samples, miR-103 and miR-107 levels were inversely correlated with CYP2C8 protein expression, which suggests that CYP2C8 might be negatively regulated by miR-103 and miR-107. miR-103 and miR-107 are paralogs and are universally expressed in essentially all mammalian tissues (particularly brain, liver, and spleen in humans). They are transcribed from the intronic regions of the PANK1 and PANK2 genes (encoding pantothenate kinases) on two different chromosomes (chromosomes 10 and 20). Their expression is thought to parallel that of the two PANK genes. The ontogeny, distribution, and functional significance of these miRNAs represent an active field of investigation, and these two miRNAs have been reported to be involved in the regulation of insulin sensitivity, glucose tolerance, cellular metabolism, lipid metabolism, angiogenesis, stress, neuronal development, cell migration, and various diseases, as reviewed previously (Moncini et al., 2011; Trajkovski et al., 2011). In silico analysis identified a target site for miR-103/miR-107, which we termed 2C8MRE, in the 3′-UTR of CYP2C8 mRNA. In primary hepatocytes, ectopic expression of precursors for miR-103 and miR-107 inhibited luciferase constructs containing three copies of the putative MRE in CYP2C8 (3XMRE) but did not affect constructs containing the reverse complementary 3XMRE, which showed that the putative MRE was functional. Stronger evidence was provided by the fact that the AsOs for miR-103 and miR-107 restored the luciferase activity of 3XMRE but did not have effects on the reverse complementary 3XMRE. These results suggest that 2C8MRE103 is functionally recognized by miR-103 and miR-107. Although both miR-103 and miR-107 recognize the CYP2C8MRE, they differ by only one nucleotide (G to C). The overall complementarity of the recognition site in the CYP2C8 UTR and the miRNAs is quite high, which allows CYP2C8 to be effectively regulated by these miRNAs. Endogenous CYP2C8 protein levels were decreased with the ectopic expression of the precursors for these individual miRNAs, and blocking of miR-103 and miR-107 expression with their respective AsOs increased CYP2C8 protein levels. There were no effects of miR-103 or miR-107 or their respective AsOs on CYP2C8 mRNA levels, which clearly indicates that miR-103 and miR-107 post-transcriptionally regulate human CYP2C8. A putative MRE was found in CYP2C9 and CYP2C19, with a two-nucleotide mismatch for CYP2C9, as well as two MREs with a one-nucleotide mismatch in CYP2C19. With ectopic expression of individual precursors for miR-103 and miR-107, endogenous protein levels for the three enzymes were reduced, compared with control values, in the order of CYP2C8 > CYP2C19 > CYP2C9. When specific AsOs were used to inhibit these miRNAs, endogenous protein levels for CYP2C19 were increased, although to a lesser degree than those for CYP2C8. The lesser effect of the miRNAs on CYP2C9 is consistent with the two-base mismatch. However, our results suggest that these miRNAs might be regulating not only CYP2C8 but also CYP2C19. MicroRNAs are implicated in many biological processes, and they have been implicated in the field of drug metabolism (Ingelman-Sundberg et al., 2007; Nakajima and Yokoi, 2011). Various drug-metabolizing enzymes, including CYP3A4 (Pan et al., 2009), CYP2E1 (Pan et al., 1992), CYP7A1 (Song et al., 2010), CYP1B1 (Tsuchiya et al., 2004), CYP2A3 (Kalscheuer et al., 2008), and CYP24 (Komagata et al., 2009), have been identified as direct targets for miRNAs. miRNAs have also been shown to regulate PXR (Takagi et al., 2008) and HNF4α (Takagi et al., 2010), thus affecting the expression of downstream targets such as CYP3A4 and CYP7A1, respectively. These data indicate that there are multiple targets of miRNAs that affect both constitutive expression and up-regulation of drug-metabolizing enzymes. In conclusion, we found that the human CYP2C family is post-transcriptionally regulated by miR-103 and miR-107, which affects CYP2C8 levels in human liver. This study provides new insights into the mechanisms of the large interindividual variability in the expression of CYP2C8 and other members of the CYP2C family in liver and other tissues. It also provides insights into various physiological and pathological stresses that may regulate these enzymes. Future studies should examine conditions that affect the expression of the PANK genes and the miR-103/miR-107 family and thus alter the expression of CYP2C8 and CYP2C19 in human tissues. Participated in research design: Zhang, Surapureddi, and Goldstein. Conducted experiments: Zhang and Coulter. Contributed new reagents or analytic tools: Ferguson. Performed data analysis: Zhang, Surapureddi, and Goldstein. Wrote or contributed to the writing of the manuscript: Zhang, Surapureddi, and Goldstein. We thank CellzDirect/Invitrogen for additional hepatocytes and assays. We thank Joyce Blaisdell for expert help with cell cultures. We thank Dr. Grace Kissling, Biostatistics Branch, National Institute of Environmental Health Sciences, for discussions on methods for the measurement of miRNAs. We thank the National Institute of Environmental Health Sciences DNA Sequencing Core Unit for assistance with sequencing. This work was supported by the Intramural Research Program of the National Institutes of Health National Institute of Environmental Health Sciences [Project Z01-ES02124]. (2003) MicroRNA pathways in flies and worms: growth, death, fat, stress, and timing. Cell 113:673–676. (2003) Role of microRNAs in plant and animal development. Science 301:336–338. (2003a) Nuclear receptor, pregnane X receptor, is required for induction of UDP-glucuronosyltranferases in mouse liver by pregnenolone-16α-carbonitrile. Drug Metab Dispos 31:908–915. (2003b) Identification of constitutive androstane receptor and glucocorticoid receptor binding sites in the CYP2C19 promoter. Mol Pharmacol 64:316–324. (2002) Regioselective metabolism of taxoids by human CYP3A4 and 2C8: structure-activity relationship. Drug Metab Dispos 30:438–445. (2001) Polymorphisms in human CYP2C8 decrease metabolism of the anticancer drug paclitaxel and arachidonic acid. Pharmacogenetics 11:597–607. (2007) Detection of human CYP2C8, CYP2C9, and CYP2J2 in cardiovascular tissues. Drug Metab Dispos 35:682–688.
. (2011) Endothelial CYP epoxygenase overexpression and soluble epoxide hydrolase disruption attenuate acute vascular inflammatory responses in mice. FASEB J 25:703–713.
. (2011) Endothelial expression of human cytochrome P450 epoxygenase CYP2C8 increases susceptibility to ischemia-reperfusion injury in isolated mouse heart. FASEB J 25:3436–3447. (2010) The miR-15/107 group of microRNA genes: evolutionary biology, cellular functions, and roles in human diseases. J Mol Biol 402:491–509. (2011) MicroRNAs as new therapeutic targets and tools in cancer. Expert Opin Ther Targets 15:265–279. (2004) The microRNA Registry. Nucleic Acids Res 32:D109–D111. (2004) MicroRNAs: small RNAs with a big role in gene regulation. Nat Rev Genet 5:522–531. (2007) Influence of cytochrome P450 polymorphisms on drug therapies: pharmacogenetic, pharmacoepigenetic and clinical aspects. Pharmacol Ther 116:496–526. (2008) Differential expression of microRNAs in early-stage neoplastic transformation in the lungs of F344 rats chronically treated with the tobacco carcinogen 4-(methylnitrosamino)-1-(3-pyridyl)-1-butanone. Carcinogenesis 29:2394–2399. (2009) Human CYP24 catalyzing the inactivation of calcitriol is post-transcriptionally regulated by miR-125b. Mol Pharmacol 76:702–709. (2003) Investigation of enzyme selectivity in the human CYP2C subfamily: homology modelling of CYP2C8, CYP2C9 and CYP2C19 from the CYP2C5 crystallographic template. Drug Metabol Drug Interact 19:257–285. (2002) Amodiaquine clearance and its metabolism to N-desethylamodiaquine is mediated by CYP2C8: a new high affinity and turnover enzyme-specific probe substrate. J Pharmacol Exp Ther 300:399–407. (1998) Regional distribution of individual forms of cytochrome P450 mRNA in normal adult human brain. Biochem Pharmacol 55:825–830. (2010) Human CYP2E1 is regulated by miR-378. Biochem Pharmacol 79:1045–1052. (2011) The role of miR-103 and miR-107 in regulation of CDK5R1 expression and in cellular migration. PLoS ONE 6:e20038. (2011) MicroRNAs from biology to future pharmacotherapy: regulation of cytochrome P450s and nuclear receptors. Pharmacol Ther 131:330–337. (2003) Tissue distribution of mRNA expression of human cytochrome P450 isoforms assessed by high-sensitivity real-time reverse transcription PCR. Yakugaku Zasshi 123:369–375. (2006) Glucuronidation converts gemfibrozil to a potent, metabolism-dependent inhibitor of CYP2C8: implications for drug-drug interactions. Drug Metab Dispos 34:191–197. (2000) A significant role of human cytochrome P450 2C8 in amiodarone N-deethylation: an approach to predict the contribution with relative activity factor. Drug Metab Dispos 28:1303–1310. (1992) Post-transcriptional regulation of mouse renal cytochrome P450 2E1 by testosterone. Arch Biochem Biophys 299:110–115. (2009) MicroRNAs regulate CYP3A4 expression via direct and indirect targeting. Drug Metab Dispos 37:2112–2117. (2010) Hepatocyte nuclear factor 4α regulates rifampicin-mediated induction of CYP2C genes in primary cultures of human hepatocytes. Drug Metab Dispos 38:591–599. (2011) Med25 is required for RNA polymerase II recruitment to specific promoters, thus regulating xenobiotic and lipid metabolism in human liver. Mol Cell Biol 31:466–481. (2002) A cell-based reporter gene assay for determining induction of CYP3A4 in a high-volume system. J Pharmacol Exp Ther 303:412–423. (2003) Temporal regulation of microRNA expression in Drosophila melanogaster mediated by hormonal signals and Broad-Complex gene activity. Dev Biol 259:9–18. (2010) A putative role of micro RNA in regulation of cholesterol 7α-hydroxylase expression in human hepatocytes. J Lipid Res 51:2223–2233. (2011) NCOA6 differentially regulates the expression of the CYP2C9 and CYP3A4 genes. Pharmacol Res 63:405–413. (2010) MicroRNAs regulate human hepatocyte nuclear factor 4α, modulating the expression of metabolic enzymes and cell cycle. J Biol Chem 285:4415–4422. (2008) Post-transcriptional regulation of human pregnane X receptor by micro-RNA affects the expression of cytochrome P450 3A4. J Biol Chem 283:9674–9680. (2005) Cytochrome P450 2C8: substrates, inhibitors, pharmacogenetics, and clinical relevance. Clin Pharmacol Ther 77:341–352. (1999) Cytochrome P450 isoforms involved in metabolism of the enantiomers of verapamil and norverapamil. Br J Clin Pharmacol 47:545–552. (2011) MicroRNAs 103 and 107 regulate insulin sensitivity. Nature 474:649–653. (2004) Human CYP1B1 is regulated by estradiol via estrogen receptor. Cancer Res 64:3119–3125. (2006) MicroRNA regulates the expression of human cytochrome P450 1B1. Cancer Res 66:9090–9098. (2002) Gemfibrozil inhibits CYP2C8-mediated cerivastatin metabolism in human liver microsomes. Drug Metab Dispos 30:1352–1356. (2003) Allelic variants of cytochromes P450 2C modify the risk for acute myocardial infarction. Pharmacogenetics 13:715–720.
. (2010) Hepatocyte nuclear factor 4α attenuates hepatic fibrosis in rats. Gut 59:236–246.